True fruit flavors blended into a frozen treat that will have you chilled and satisfied. 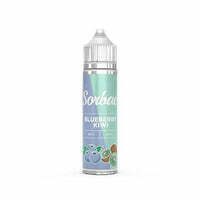 Blueberry Kiwi by Sorbae E Liquid brings together, exotic, tart kiwi and succulent, juicy blueberries for a sweet sorbet blend with a hint of menthol for extra authenticity. Upon first inhale you'll experience a blast of bold fruit flavor that will have you shocked by just how completely realistic and delicious it is.